The evening was coming on fast as we drove along the main road heading out of Yogyakarta. We were fighting the traffic in our first attempt to reach Candi Ratu Boko. This time however, it was not to be. With 20 minutes left before we would arrive at the temple and the sky already turning shades of purple and pink we admitted defeat and turned the bike back towards town. Two days later, on a warm Saturday afternoon, we headed out of Yogyakarta on our second attempt to reach Candi Ratu Boko. We followed the main road out of the city towards Prambanan. At the traffic lights before the temple complex, we hooked a right, crossing the rutted railway lines and following a winding road that cut through green paddy fields and small villages. After a short drive we turned off the larger road and headed up a sequence of smaller tracks that snaked slowly and lazily towards the large wooded hill, the only prominent feature of the surrounding countryside. I had been told that this was where we would get the best view of sunset around Yogyakarta, but never having visited the site before I was unsure what to expect. The first thing that struck me about Candi Ratu Boko, was just how enormous the complex was. It covers an area of at least two square kilometres and there are numerous half destroyed shrines that are in the process of reconstruction. The only structure that appears intact is the large doorway that obviously used to be the entrance to the entire site. Surrounding the complex are the remains of a large wall. 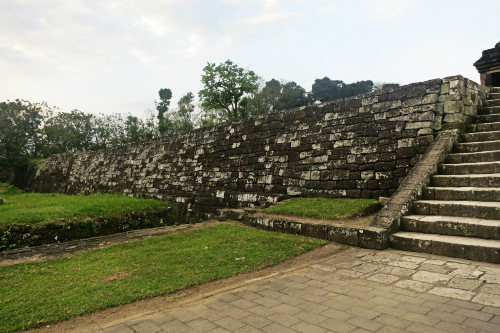 After taking some obligatory photos, we strolled around the area with the few dozen other tourists (the majority of whom were Indonesians) who had decided to visit Candi Ratu Boko that day. We stayed at Candi Ratu Boko until shortly after sunset. It’s a great place to visit and a nice alternative or addition to a visit to Prambanan. The view of the sunset from the top of the hill is something really special and for this reason alone the site is worth a visit. Thanks for Sharing, Some of the pictures are really awesome and great. I just love the way of your presentation and as well as. I am nature lover I want to visit it too…. please visit our Blog The best way to see Himalayas! I found the pictures are really awesome. It took my attention. It’s a new experience that seems to be calling me. Thank you for keeping us informed and really a great post.